Protection, style, and personality, those are the elements that Spigen focuses on with its Ultra Hybrid case for the Google Nexus 5. As we already know, the accessory maker is known to deliver some quality cases in the past – and it’s looking like the same for this model! Due to the case’s shock absorption and full enclosure, the Ultra Hybrid case adds some bulk to the handset’s overall size. However, it’s nothing as extravagant as some of other rugged styled cases from Otterbox. The majority of the case is comprised out of this soft, yet durable TPU material that helps it cushion the handset in the event of a fall or drop. Not only will it save the handset from small heights, but the Ultra Hybrid case even protects it sufficiently from higher heights. At the same time, the rubbery sidings of the case offers us a meaningful amount of grippage when it’s held in the hand. Now, the entire rear of the case is actually clear, allowing us to see the back of the handset itself. Interestingly enough, the case comes included with two printout designs meant to be placed on the inside portion of the case, so that the image is seen through. It’s a nice touch, but it doesn’t seem like Spigen offers any more printout designs on its site for the case. With the design, the case is slightly raised around the edges so that the display of the phone doesn’t come into contact with the surface when it’s placed down on its screen. Although the sides of the phone are encased, accessing its power button and volume controls isn’t a problem at all. Whereas most cases tend to make it difficult to connect wider headphone jacks, the cutout for it on the case is pretty wide enough to accommodate most cables. 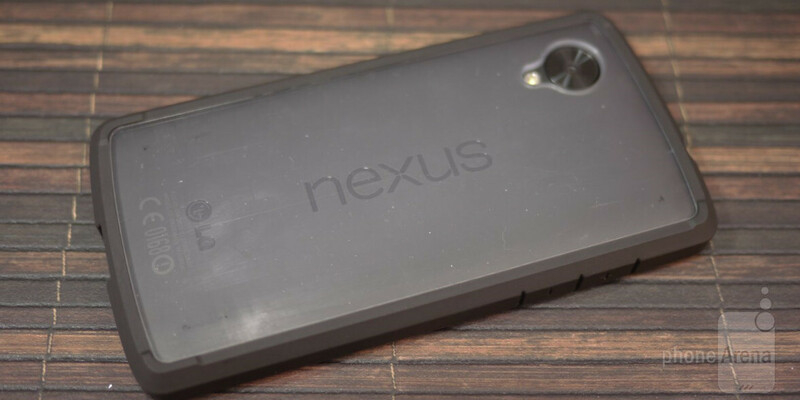 Ultimately, there’s no arguing that there’s both style and protection with the Spigen Ultra Hybrid case for the Nexus 5. Better yet, the purchase of the case comes with a screen protector – giving the handset protection from all sides and edges. Priced at $24.99 and available in four different paint jobs, this is something owners will want to consider!